Given that Ukraine’s business associations are among the country’s weakest civil society institutions — such associations did not exist during 70 years of Communist rule — small and medium-sized enterprises (SMEs) are underrepresented nationally in civil society and political life. Despite this fact, Ukrainian public discourse on issues affecting the business community is vibrant and relatively open. This appears to be improving on the regional level, in part through CIPE support of business associations representing SMEs, a little more notably each year. Individual business associations, as well as eight new coalitions of associations, now work collectively at the regional level. In early December, CIPE Ukraine will kick off the fourth annual capacity building training program in Kyiv. CIPE’s intensive training programs have helped to develop a network of business associations, think tanks, and other private sector organizations to support these growing initiatives. As a result of CIPE’s efforts, eight cross-regional and cross-industry coalitions of business associations are at work. They focus on issues ranging from business protection and action against government interference in entrepreneurial activity to anti-corruption. As CIPE Ukraine prepares to launch its fourth training program, CIPE’s partner continue to grow in numbers and capacity, working together to set the stage to further strengthen the voice of the business community at large on high-priority issues. For the past three years, Ukraine’s associations have received intensive training to improve their advocacy skills, build management and leadership capacity, expand their membership bases, and lay the groundwork for collective action prior to taking on an anticorruption program. The main goal for this year’s program, Building Advocacy Momentum, is not only to further increase business associations’ capacity and to encourage cooperation through the building of coalitions of business associations, but also to support advocacy initiatives in the areas already identified by entrepreneurs as being of specific importance to the business community. In early July of this year, CIPE held a two-day forum for business associations, in cooperation with the Ukrainian Chamber of Commerce as well as the German Society for International Cooperation and the Naumann Foundation. At the forum, past and present partners from across Ukraine’s regions convened to discuss advocacy priorities for chambers and business associations in the run-up to a presidential election set for 2015. The sheer number of interested participants — more than 120 — reflected an even higher national recognition of CIPE’s work in Ukraine than anticipated. With CIPE-supported coalitions of business associations mobilizing diverse constituencies and defining issues, the forum was evidence of how the SME community is increasingly adept at defining issues and taking part in civil society. Despite the fact that chamber and business association leaders work in a poor economy, with small budgets and lack of large-scale business support, a follow-up assessment of the forum noted that participants showed themselves to be hungry for knowledge, examples, and practical ideas for implementation. Not only that, but they worked across great divides and in cooperation with one another to advance common goals relevant to the broader business community, and the civil society they represent. As CIPE Ukraine prepares for the next training program, interest is growing rapidly: this year, CIPE received 48 eligible applicants for 25 openings. The applicants came from across Ukraine and from both the private and public sectors. 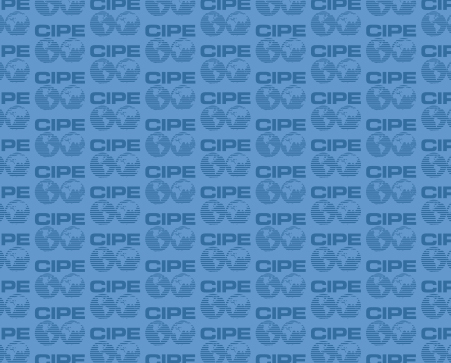 Concurrently, in early November, CIPE selected five business associations, and CIPE partners, working on inter-regional initiatives to receive small grants working on a variety of issues, including the simplification of the regulatory environment for small and medium-sized enterprises, anticorruption work in regards to privatization, and the improvement of regulatory practices. On September 20, leaders of 14 business associations from across Ukraine took their cooperation one step further and discussed the creation of a national platform to support small and medium-sized enterprises (SMEs) in advocacy campaigns. During the discussion, the leaders decided that the platform would be an independent network of associations working on economic policy issues, representing the interests of SMEs both domestically and internationally. CIPE partners and Ukrainian business coalitions have been actively working on policy recommendations for draft laws, engaging in public-private dialogue with regional authorities, and even taking part in parliamentary hearings, addressing the need for economic empowerment in Ukraine – including access to credit and business training programs. As Ukrainian writer Nikolai Gogol also wrote: “A word aptly uttered or written cannot be cut away by an ax.” As the networks of business associations and coalitions grow in Ukraine, these words ring loud and clear – the voice of civil society coming together grows more powerful by the year, cooperation paves the way for change in Ukraine as the voice becomes apt, resolved, and strong, across both diverse regions and different industries. Rachel Grossman is Program Assistant for Eurasia at CIPE.